During the first two weeks of December, a virulent plague takes hold of Havana. Immunisation is impossible and there’s no option but to surrender. The consolation is that there are so many fellow-sufferers with whom to compare notes on symptoms, cures and pulling extended sickies from work. Employers are not inclined to be sympathetic to doctor’s certificates for Cinemania Febril Virulans, or to give it its common name, Film Fever. The cause of the epidemic is the annual Latin America Havana Film Festival. For a fortnight, queues wind round and round the blocks which house the main cinemas and a hot trade takes place in passes and tickets. The riskier the film, the further from the centre of town it seems to be shown, so serious movie buffs often find themselves driving to tiny cinemas in obscure little villages in what seems like the back of beyond to see films which don’t always merit the journey. But a desperate must-see mentality has the habaneros in its inexorable grip, and all reason is abandoned in the keen-eyed pursuit of celluloid novelty. The names of the stars are on everyone’s lips, scandalous gossip about their private lives passes from balcony to balcony and strange disjointed conversations take place about the convolutions of plots and individual characterisations as the previous night’s offerings are mercilessly dissected in kitchens and offices all over the city. The infection spreads like wildfire and before very long it passes to cities all over the island. 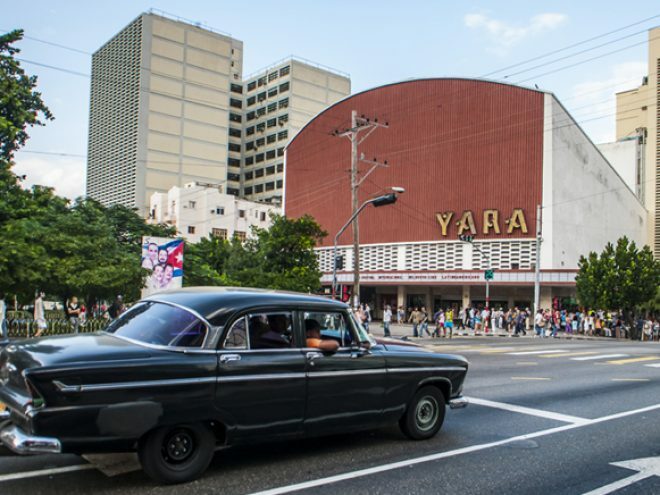 With the same enthusiasm exhibited by their ancestors, millions of film buffs throughout Cuba support the Festival, which has served as a launch pad for Latin American cinematography and become one of the leading festivals of the region. With awards in categories that include animated film, documentary, fiction, first work, unpublished script and poster, as well as direction, screenplay, actor, actress, art direction, music, film editing and sound, the Festival has not only honoured filmmakers and technicians of the region, but also the best films on Latin American subjects by directors from further afield. Further awards are presented by the International Federation of Film Critics (FIPRESCI), Cuban cultural organisations and the local media. One of the most coveted prizes is the Audience Award, bestowed after lengthy and passionate deliberation by the most demanding of juries: the public. Numerous professional workshops and seminars also take place throughout the Festival and a number of further projects have been developed around it. Amongst them are the New Latin American Cinema Foundation and the International Film School of San Antonio de los Ba?os, located in a small town near Havana that receives applications from young people from all over the world who wish to study cinematic techniques under the tuition of Cuban and foreign film-makers. The energetic atmosphere of the Festival and the discussions it provokes have caused numerous cinematic celebrities to visit Havana: Steven Spielberg, Pedro Almodóvar —accompanied by his creative harem—, Francis Ford Coppola, Carlos Saura, Oliver Stone, Robert Redford, Jack Nicholson, Robert de Niro and Michel Legrand have been welcomed with the same enthusiasm with which earlier habaneros greeted Marlon Brando, Ava Gardner, Frank Sinatra, Cesare Zavattini and Alain Delon. It remains to be seen whether one of Havana’s barmen will create a cocktail named after a star… somehow asking for a Cameron Diaz doesn’t have quite the same ring to it as a request for a Mary Pickford. The Havana Film Festival has also contributed to the recovery of Cuban cinematography, which had declined due to the economic crisis in Cuba in the 1990s, by supporting partnerships with overseas production companies. A recent collaborative success was the much-awarded Suite Habana, directed by Fernando Perez, one of the most important figures in current Cuban cinema. The film is controversial on two fronts: firstly because it strays back and forth across the line between documentary and fiction; and secondly because viewing it is an uncomfortable experience for those who had been led to believe by the title that they were about to see a romanticised account of the city. Suite Habana is anything but: Perez’ camera lingers lovingly on the minutiae of Havana’s decay, and whilst it is certainly true that the lighting and detail of observation bestows a certain beauty upon the subject, the overall message is a tough one, without a word of dialogue, based on an intense counterpoint between image and ‘found sound’. This film reveals to the discomfited viewer the corners of the city that are never included in package tours and the anguish, frustrations and hopes of the people who live in them. It’s the variety and creativity of films shown at the Havana Film Festival every year that attract thousands of visitors eager to experience Latin American cinema, meet its most significant figures, attend collateral screenings and throw themselves into the frenzied comings and goings of Cuban moviegoers. Film fever, like malaria, recurs, but if you’re not afraid of infection we’ll see you in Havana in December. Descember 2014 This article formed part of the descember 2014 issue of What’s On Havana The definitive monthly travel & culture guide to Havana Download our current issue of What’s On Havana, your definitive travel, culture and entertainment guide for all things happening in Havana, Cuba’s bustling and enigmatic capital city. We include features from around Cuba written by the best international travel writers covering Cuba. Our monthly online digital magazine is also available in Spanish and French.